The law dictates that construction companies have a duty to protect workers while on site. This includes making reasonable accommodations that create a safe working environment. Due to the nature of work that takes place at a construction site, there is significant potential for injuries occurring if steps are not taken to prevent or remove hazards. Workers at a construction site are entitled to feel safe when on the job. 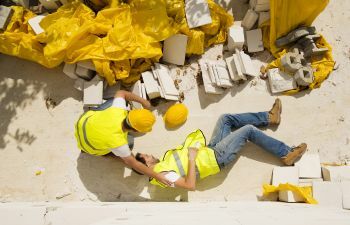 If an accident occurs and the construction company is found to have been negligent, injured parties may seek compensation through a personal injury claim. The construction company also has a duty of care toward workers or the general public who are traveling either on foot or in a vehicle near the site. Despite mandatory safety regulations, accidents are still common on construction sites. There are so many potential dangers that injured parties may struggle to establish who, if anyone, is liable for injuries. You may suffer injury due to the negligence of an individual or an entity. In many cases, multiple parties share a percentage of liability in construction site injury cases. Third parties such as property owners, manufacturers of machinery or contractors may contribute to creating a hazard that leads to an accident. It is in your best interests to consult with an experienced construction site injury lawyer if you have been hurt through no fault of your own. Larger, stronger cranes have made it possible for us to build soaring skyscrapers. However, lifting equipment is potentially dangerous and may cause injuries or fatalities in an accident. At least a quarter of all construction site fatal accidents are likely to involve a crane or other lifting equipment. If negligence played a part in the accident, you may have a case for compensation against responsible parties. Scaffolding is a highly effective means of creating structures and platforms that allow workers to reach great heights. Unfortunately, scaffolding is also involved in a large percentage of construction site accidents. Falling off scaffolding, structures collapsing and being struck by falling debris or tools are common causes of injuries and fatalities. If scaffolding is not erected correctly, it can result in an unstable structure that does not meet reasonable safety standards. Power tools are essential for completing various jobs on a construction site. If tools are defective, it may result in serious injuries or fatalities. Workers should also use necessary safety equipment such as goggles, safety gloves and hardhats when using power tools. Again, there are multiple parties who may share liability if you are injured by power tools on a construction site. You should consult with a personal injury lawyer who has experience in construction site accident cases. Ligori & Sanders, Attorneys at Law can provide a free consultation to discuss the details of your accident to determine if you have a potential case for compensation. You may face substantial medical costs as a result of your injuries, so seeking a fair award from those who were liable for the accident is your right.